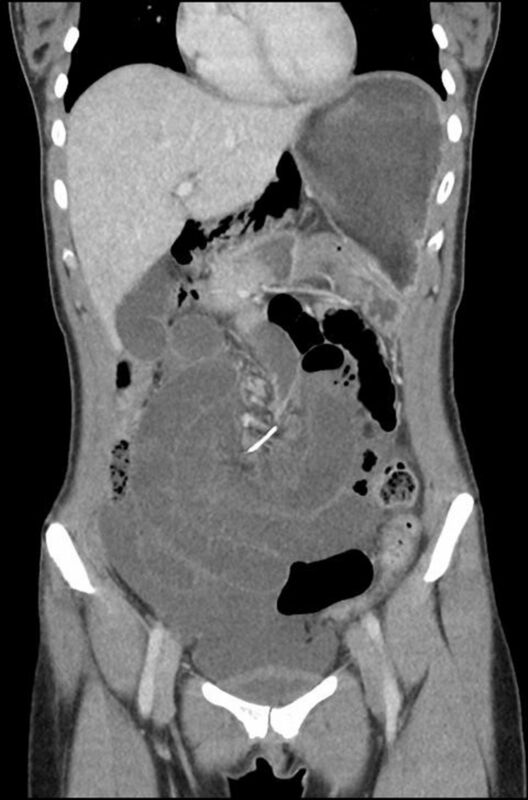 Enlarge / The CT scan reveals the wire (small white line in center) that was causing the woman’s abdominal pain. Years after straightening teeth, the thin metal wires from orthodontic braces can end up twisting intestines, according to a report published Monday in BMJ Case Reports. Australian doctors found a seven-centimeter bit of dental brace wire in the bowels of an otherwise healthy 30-year-old woman. She told doctors she had her braces removed 10 years earlier and didn’t recall swallowing or missing any bits of wire. The case seemed to flabbergast her doctors. Most of the time, if an inert foreign object reaches a person’s intestines, it can pass the rest of the way without a problem. But things that do end up getting stuck tend to do so at the sphincter muscle valve that separates the small and large intestines. In the case of the woman in Australia, the wire was caught tearing up and twisting the middle of her small intestine. The case “is therefore novel in the decade delay in presentation and the clinical sequelae,” the doctors concluded in their BMJ report. They recommended that other doctors always keep in mind that surprise foreign objects can be behind otherwise unexplained abdominal pains, and quick scans are always a good idea. That was what helped in this case, at least. Initially, the woman arrived in an emergency room complaining of worsening pain. Despite negative test results, doctors’ best-guess diagnosed was a gallbladder attack caused by a gallstone blocking a bile duct. 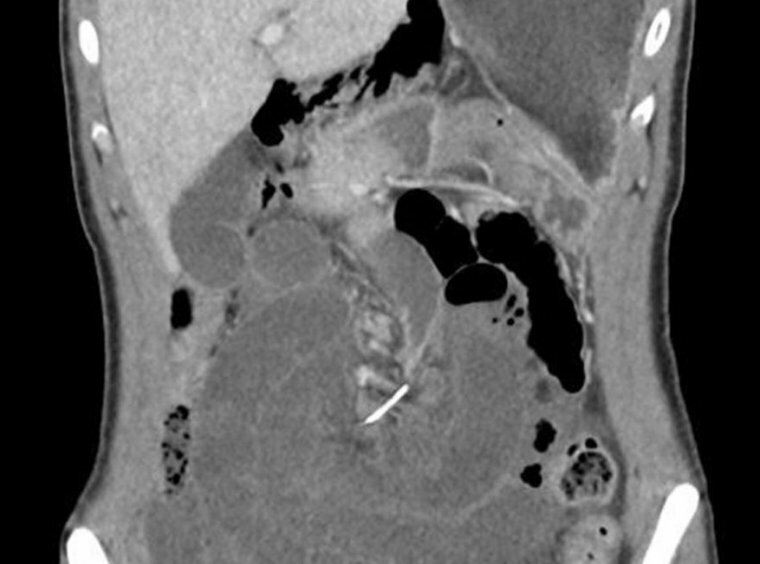 But a CT scan later revealed a “metallic wire-shaped foreign body” was the real culprit. When doctors went in to operate, they found that the wire had pierced several spots of her small intestine and caused it to twist around itself, a condition called a volvulus (here’s a gory picture of it. Warning: it’s gory. But if you look closely, you can see the thin metal wire being held by the tweezers). Luckily, now that the wire is out, the woman is expected to make a full recovery. BMJ Case Reports, 2017. DOI: 10.1136/bcr-2017-221152 (About DOIs).